Bread pudding has always been a great way to use up stale bread and give it a wonderful luscious second life. In French, bread pudding is called "pain perdu" which literally means lost bread - and was one of the great recipes cooks came up with to use leftovers. So by all means, this recipe could be made with sourdough stale bread, or any kind of bread that can be sunk in a flavorful liquid, but I cheated a little. I used panettone, a wonderfully fragrant Italian bread that resembles coffee cake. 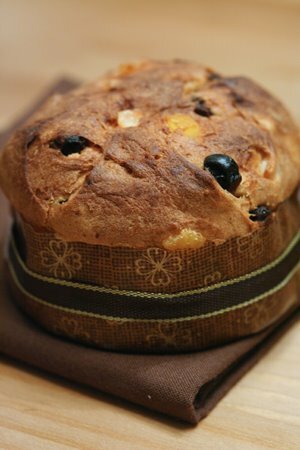 You can find panettone made with dried fruit, and all kind of elaborate concoctions. The bread itself is slightly sweet and dry and soaks up custard in the most beautiful way. I'm not sure the picture really does the dessert justice: when you take it out of the oven, the bread puffs up, the custard is almost bubbly and the chocolate seeps through. I took the picture a little late (yes.. I had to taste one of the batches first) so the bread isn't at its puffed potential, but I'm sure you get the idea! In a medium mixing bowl, combine the eggs, milk, sugar, Grand Marnier, and vanilla. Beat until well mixed. Roughly slice the pannetone into one inch cubes. Butter the ramekins and place half of the panettone cubes at the bottom of each. Disperse 1/2 tablespoon of chocolate in each ramekin and cover with the remaining panettone. Pour the egg mixture over the panettone, and lightly push down with a fork until the panettone is covered with egg mixture. Bake in the preheated oven for 45 minutes, or until the egg mixture is just set. Serve warm with chocolate shavings. Enjoy! Sounds divine, I love panettone! 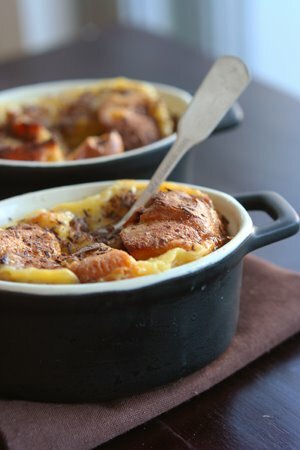 Bread pudding is so homely and comforting, I love ur version! Beautiful! What wondeful pics! looks delicious! What a great recipe! Very nice presentation. I like individual treats like this. It makes your guest feel something special, I think. Looked so good and yummy. Oh my - this looks great! What a great dessert for the holidays! I have small Le Creuset pots and actually saw a small set Of Cocottes at Coscto today. I have just discovered your beautiful blog. Thank you for seeing me..I see you now..Off to peruse more. Awesome results and photos. Can't wait to make panettone myself ! That bread pudding looks great! I've have only had 1 bread pudding recipe that i've really liked, but this recipe looks and sounds delicious!